On Friday the 6th of April, the initiation workshop for the ‘Bongo Hub’, took place in Dar es Salaam. Since three years, I am hosting U.Lab sessions in the Arusha hub, mainly focusing on the U.Lab MOOC, transforming business, self and society. My dream is to grow this hub, and see all kind of innovations coming out of it that contribute to a healthy economy in Tanzania. Through this process, I met Angelika Farhan-Reimpell, who shares a similar dream. Our meetings were filled with energy and ideas. We decided to go for it. We both started talking to people, and shaping the idea that the Hub should be co-created using the U Process. The co-creators are the potential members, users and supporters of the Bongo community. 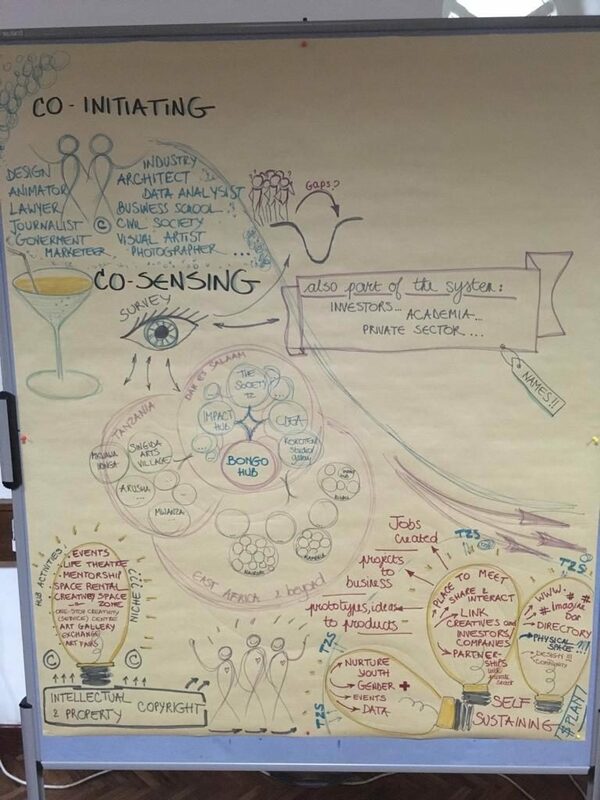 We started with co-initiating and co-sensing in the 6 April workshop, where we tried to get the system in the room, such as representatives from architects, IT, marketing, artists, photographers, design and animations, legal sector, business, NGOs. In the workshop we got to know each other, identified key stakeholders, had stakeholder interviews as a start of co-sensing and we formed a driving team. The spirit was positive and constructive and everyone is willing to put time and energy into this besides their busy jobs. The coming months are a continuation of co-sensing… what is our context, what do different stakeholders need, how can we involve all voices, even the sceptical ones, what are existing laws and regulations we need to comply with? And of course what can we learn from similar journeys. If you are interested in joining or sharing your experience, please contact Monique Janmaat and become part of this exciting process.